We’d love your help. Let us know what’s wrong with this preview of The End of Loneliness by Benedict Wells. Jules Moreau’s childhood is shattered after the sudden death of his parents. Enrolled in boarding school where he and his siblings, Marty and Liz, are forced to live apart, the once vivacious and fearless Jules retreats inward, preferring to live within his memories--until he meets Alva, a kindred soul caught in her own grief. Fifteen years pass and the siblings remain str Jules Moreau’s childhood is shattered after the sudden death of his parents. Enrolled in boarding school where he and his siblings, Marty and Liz, are forced to live apart, the once vivacious and fearless Jules retreats inward, preferring to live within his memories--until he meets Alva, a kindred soul caught in her own grief. Fifteen years pass and the siblings remain strangers to one another, bound by tragedy and struggling to recover the family they once were. Jules, still adrift, is anchored only by his desires to be a writer and to reunite with Alva, who turned her back on their friendship on the precipice of it becoming more, but just as it seems they can make amends for time wasted, invisible forces--whether fate or chance--intervene. To ask other readers questions about The End of Loneliness, please sign up. A well written story affords us the opportunity to feel what the characters are feeling even if their experience is not one that is totally familiar. I know what grief feels like over losing loved ones, but I don’t know what it’s like as a child to lose both parents and carry that grief throughout your life. This is a such a well written story that I found myself totally immersed in the grief of Jules, Marty and Liz Moreau, so much so that I cried at times with them and for them. This is such a profound story about loss and loneliness and the effect of losing their parents and the life they knew, but it’s at the same time about how life goes on, about love, about memories. Even with the pervasive grief that makes this heavy and dark at times, there is hope and there are moments of joy. Jules is the narrator, so you might say it’s his story but it’s also Marty’s and Liz’s and Alva’s story, the woman who has been in Jules’ heart from when he was a child at the boarding school the siblings were sent to. I don’t want to say much about the plot, except that it depicts how they lose themselves and each other and this is the story of their journeys to move forward. Bottom line is that I loved it, the introspective nature of it, the characters’ self awareness as they try to cope. It’s very philosophical as well, raising big questions such as how much does an individual control control his or her feelings and shape their life moving forward. These are some of the most affecting characters I’ve encountered in a while. I always feel as if I’m taking a risk when I read a translation of a book, because I think I might not fully get what the author is trying to convey in his or her native language. The beautiful translation of this book felt true to me and it felt like English was the language it was written in, so kudos to Charlotte Collins who translated this book. This will definitely be on my list of favorites for the year. Kevin Ansbro Amazing review, Angela. Added it! Angela M Kevin, thanks very much. Hope you love it! "What is it that makes a life into what it becomes?" Profound, sonorous, poignant, and deeply cathartic, The End of Loneliness is but one of the few novels that I would consider a literary magnum opus — a league on its own. Brimming with philosophical ruminations, insurmountable truths, and penetrating insights, it explores grief, life and death, camaraderie, yearning, solitude, and dreams of the lives forgone. "What if there’s no such thing as time? If everything we experience is eternal, and it’s not time that passes us by, but we ourselves that pass by the things we experience? I often ask myself this. It would mean that while our perspective would change and we would distance ourselves from treasured memories, they would still be there, and if we could go back we would still find them in the same place. Like leafing through a book backward, perhaps even back to the beginning." Devastated by the death of their parents, Jules Moureau along with his siblings the unconventional Liz and the nerdy Marty are shipped off to a boarding school. With shattered lives, the siblings try to cope amidst the grief, pain, and loss. While in boarding school, Jules meets the mysterious Alva and their world will never be the same again. "She looked into my eyes, and I’ll never forget how in doing so we were able to glimpse each other’s inner worlds. For one brief moment I saw the pain that hid behind her worlds and gestures, and in exchange she sensed what I held deep inside." Several years later, the siblings, consumed by years of heartbreak and loneliness, reunite and forge a bond that ultimately changes the course of their lives. Meanwhile, Jules is still stuck in his "dream", he chases a ghost, in the form of his first love, Alva, calling back the past, grasping those fleeting moments — lives that could or might have been. Beautifully told and written with exquisite prose and multi-faceted characters, Wells genuinely captures the heart and caresses the soul. With steady pacing, the novel allows the reader to reflect and meditate on several illuminating passages. This is something that needs to be slowly savoured and not devoured. It rather ends in a mellifluous and hopeful denouement, but not before encountering life's trials and tribulations. I have to commend Charlotte Collins for the brilliant translation. It's as if it was written in its original German language. For someone who has befriended grief, pain, loss, and death for a long time since I was eight years old, this novel encapsulates all the broken parts in me that made me who I am today. "Kierkegaard says the self must be broken in order to become itself [...] To find your true self you need to question everything you encountered at birth. And lose some of it, too, because often it’s only in pain that we discover what really belongs to us... It’s in the breaches that we recognize ourselves." Reminiscing about the past, it always brings me to tears when I think of those memories especially that part of me that I left behind in the darkness. "Life is not a zero-sum game. It owes us nothing, and things just happen the way they do. Sometimes they’re fair and everything makes sense; sometimes they’re so unfair we question everything. I pulled the mask off the face of Fate, and all I found beneath it was chance." That said, I’ve long been afraid to love with all of me for the fact that every time I love someone, it never seemed to last long enough. Every time I give all of me, I don’t get everything back. I have embraced my solitude for far too long that I've forgotten how it’s like to have someone there to help me even if I have a few friends surrounding me. I'm really blessed to have known my Alva, "someone who could be sad, warm-hearted and cheerful all at once." Alva showed me that it's okay to trust and it’s okay to get hurt because someone will be there to pick up the shattered pieces of my heart. Alva broke the strong walls and barriers that I've built around me. Alva pulled me back when I wanted to walk away. Alva told me to stay because I’m sick of always being left behind. Alva understood me wholly and I can honestly say that that was the end of my own loneliness. Perchance, yours too. "The only way we can overcome the loneliness within us is together". Kimberly Dawn Love the way that your deep intellect and compassion coexist, JV. That in itself is a rare quality. And somehow when you choose to be, you are hilario Love the way that your deep intellect and compassion coexist, JV. That in itself is a rare quality. JV ❄️☃️❄️ Kimberly Dawn wrote: "Love the way that your deep intellect and compassion coexist, JV. That in itself is a rare quality. And somehow when you choose Kimberly Dawn wrote: "Love the way that your deep intellect and compassion coexist, JV. That in itself is a rare quality. And somehow when you choose to be, you are hilarious as well. Multifaceted one, you are!" My gosh.... the purity of this novel is beautiful. The storytelling MAGNIFICENT! “Molokai” by Alan Brennert, “To The End of Your Life Book Club”, by Will Schwalbe, and “The History of Love”, by Nicole Krause are a few books. - just to name a few- I’ve given away to people many times. I like to bring a book - rather than a bottle of wine to dinner invitations. I ‘already’ have a frien My gosh.... the purity of this novel is beautiful. The storytelling MAGNIFICENT! I ‘already’ have a friend - Jamie - from Calgary who visits our AirBnB for a few days once a month when here on business), buying this novel for his wife.....( a valentines gift). This is the type of book - that my long time close friend - Lisi- would call me up and say: READ IT! JUST READ IT, Lisi says...and I do! I trusted my friend Peter, the same way. I should really end my review here — simply invite EVERY FRIEND I KNOW - male and female - everyone who loves a great literary marvel....to READ THIS BOOK! Friends can stop here - no need to read another word from me. Other than READ IT! I’ll share a little - but it’s a book to experience yourself. This slim book captures the complexities of love, desire, and tragedy, brilliantly. “It was important to have one true friend — a soulmate. Someone you’d never lose, who would always be there for you. He said that was much more important than love”. Marty and Liz ( siblings of Jules), Toni, and Alva. These are characters you come to know well. Alva’s character was the most challenging character for me to ‘deeply’ understand for awhile .... but after unraveling of her layers of who she was - I was richly rewarded with knowing her as I would a close friend. Jules - and I share much in common. He was the youngest in his family - we both had a loss that we’d never wish for any child. We both sat in the backseat of the family car. We both felt that nobody really expected anything of us as kids. Our adults and older siblings shared important conversations in the front seat of the car... but nobody thought we munchkins were listening intensely. We were - listening. Alva asked Jules: “what it had been like for him and his siblings driving to a new home for the first time after his parents death?” I felt I knew what it was like for Jules. Jules was six when his parents died. I was 4 when my father died. A WONDERFUL book club pick. Much to chat about each character. I’m chatting with my daughter about this book - in Canada - ‘now’ - at the SAME TIME I’m trying to write a half way decent review - I’m nuts.....really nuts. I’d be better at verbally chatting with others about this novel than writing.....but I’m giving this process my best effort. I look forward to verbal conversations with our friends. ...... just some thought provoking dialogue that either I resonated with, or I want to talk about it more, or I was just ‘moved’ by the beauty of such intelligent emotional writing. “This constantly being alone is killing me”. “Yes, but the antidote to loneliness isn’t just being around random people indiscriminately, the antidote to loneliness is emotional security”. and all this time I couldn’t stop staring at Alva’s beautiful ‘film noir’ face, looking into those big, luminous, pale green eyes; and another drink and we sank into blessed drunkenness, and to my astonishment I said, what I’d really like to do is leave my job, move away from Berlin and just write. And suddenly it was as if I found my inner voice again, and finally I admitted I missed Alva”. “For a moment I felt as if our real selves were far away, and we sent two negotiators to a bar who weren’t authorized to talk about the really important things”. “Alva’s hands, gesticulating as she spoke, or her teeth when she laughed, which she did a lot that evening, she had accepted her slightly crooked front tooth and didn’t hold up her hand in front of her mouth anymore”. “Time isn’t linear; nor is memory. You always remember more clearly things you’re emotionally close to you at any given moment”. “I hardly knew my father. I often wonder what our relationship would be like if he were alive. Would we have much to do with each other? Or perhaps even be friends? I’d like to sit in a bar and chat with him, too, as adults. I missed out on everything. Conversations, little moments, father-son stuff”. “The only people for me are the mad one’s. The ones who are mad to live, mad to talk, mad to be saved, desirous at everything at the same time, the ones who never yawn or say commonplace things, but burn, burn, burn like fabulous yellow roman candles exploding like spiders across the stars”. This novel is soooooooooo GOOD! Extraordinary depth and beauty!!! A 2019 BIG TIME FAVORITE!!! MANY THANKS TO MY BUDDY REFERRAL, *Peter*! Kevin Ansbro Hearing such good things. A stunning review, Elyse. Added it! Candace Moving review, Elyse! I'm adding it. My first five star read of 2019. Five stars because it gave me a very good story, some great and memorable characters, as well as delivering all the feels. A complimentary side of marshmallow thrown in for good measure. When the story opens we are introduced to Jules. He is lying in a hospital bed recovering from a motorcycle accident. The reason for the accident is in doubt. He then flashes back to his past, and the reader follows he and his siblings as they are delivered to a just barely servic My first five star read of 2019. Five stars because it gave me a very good story, some great and memorable characters, as well as delivering all the feels. A complimentary side of marshmallow thrown in for good measure. When the story opens we are introduced to Jules. He is lying in a hospital bed recovering from a motorcycle accident. The reason for the accident is in doubt. He then flashes back to his past, and the reader follows he and his siblings as they are delivered to a just barely serviceable boarding school. Jules is just ten, Marty and Liz, a little older. His parents killed in a car accident, the children barely given time to grieve. Here the siblings will grow apart, but it is also here that Jules will make a wonderful friend that will have a huge impact on his future. His relationship with Alva, also a lonely young woman with a huge grief in her life provide the nucleus of the novel. Sometimes translated novels can be tricky, meanings changed due to word choices. To be honest, there were a few such incidents here, but it didn't change the meaning of the story, nor affect the way I felt. Early childhood trauma changes us, and this is brilliantly shown in the lives of the siblings. There is sadness, happiness, but also a longing for a reality they can call their own. Steps and missteps in relationships, career choices. Yet, these are well rounded, realistic characters that I came to cherish. Their pain, lonliness, times of happiness, so aptly displayed that these felt like actual people i had come to know. People I felt for and with, wanting them to overcome their loss early in life and find joy. What they go through and whether they accomplish this goal, is the story, one you will have to read yourself. I hope you do. Diane S ☔ Thanks so much, Kevin. At first i was curious about an unusual story by Benedict Wells, so i was excited to read. Benedict Wells has a great writing style. He usualy knows how to handle with words, but did not touch me with his style of writing. The destiny of the main character is directed by the arbitrariness of the autor without surprising moments and changes of tacks. This was a very moving account of three siblings from Munich, Germany who tragically lost their parents in a car accident. The story is told from the perspective of the youngest son, Jules. As the story begins, a now adult Jules wakes up in hospital realizing he has survived a motorcycle accident. Both Jules' older brother Marty and the hospital psychologist question whether it was an accident or a suicide attempt. From here, the story rewinds to its beginning. Jules is a carefree, brave and outg This was a very moving account of three siblings from Munich, Germany who tragically lost their parents in a car accident. The story is told from the perspective of the youngest son, Jules. As the story begins, a now adult Jules wakes up in hospital realizing he has survived a motorcycle accident. Both Jules' older brother Marty and the hospital psychologist question whether it was an accident or a suicide attempt. From here, the story rewinds to its beginning. Jules is a carefree, brave and outgoing child of 7. He loves his apartment where he can look down into a pleasant courtyard. His pretty Mom plays a Beatles cassette in the car as they make their annual summer jaunt to visit Grandmother in her ivy-covered house in the south of France. Dad is an aspiring photographer, but in reality is an accountant. He is well thought of at work and has an engaging personality. The Moreau's family life seemed rather idyllic during this early period, and I was easily lured into the story. As time progresses, the father doesn't seem as sound of spirit as he used to be. He comes home from work later than usual and seems agitated. The parents' marriage doesn't seem quite as loving as it used to be. To that end, the parents go away alone on a trip hoping for a restorative effect on their marriage. Instead, they wind up dying in a car accident. This results in Jules, Marty, and the oldest- sister Liz- being sent to a boarding school. Jules is separated from his older siblings in the building. Still in shock and mourning, Jules is not the same madcap, ebullient personality he used to be...especially in this new environment. Then he meets a girl named Alva. Jules used to sit towards the back of the class, keeping to himself. Alva started sitting next to him. One rainy day, she came over to his room at the boarding school where he played her a Nick Drake album; one of his Mom's favorites. Alva's passion was reading, and she could always be found sitting in some improbable position atop various pieces of furniture, enthralled in a book. Jules used to have a passion too...for writing stories. Jules never forgot something his father fervently told him: "The most important thing is that you find your true friend, Jules. Your true friend is someone who's always there, who walks beside you all your life. You have to find them; it's more important than anything, even love. Because love doesn't always last." Jules was certain that person was Alva. This was a very rich story spanning decades in Jules' pursuit and devotion of Alva. His single-minded focus on her is unwavering. It also follows the interesting and unfolding lives of Jules' siblings, Marty and Liz. The character of Jules is very likeable and sympathetic. He has emotional issues to work on, to come to terms with the last moments he spent with his father before he was snatched by death. This is also a story of a family that is always there for each other, and it was a very touching read. The book opens with the line: I’ve known Death a long time, but now Death knows me. Jules wakes in a hospital bed - he’s been in an accident and he’s pretty beaten up. He tries to piece it together: a motorcycle accident, but there’s something before that, something his mind doesn’t want to recall. We’ll find out what that is… but not yet, not for quite some time. We flashback to his childhood and learn that he lost his parents early in life, the result of a car crash. He, his brother Marty and The book opens with the line: I’ve known Death a long time, but now Death knows me. We flashback to his childhood and learn that he lost his parents early in life, the result of a car crash. He, his brother Marty and sister Liz were dispatched to a grim boarding school. The idyllic life they’d led to this point is gone, replaced by something else. At the school, Jules meets the red haired Alva, a similarly introverted being; they strike up a friendship. Marty also finds a friend in Toni, who will eventually become a friend to all three siblings. Liz, on the other hand is a bit of a loner, but wild too: she wants to live life to the full and to experiment. As the book unfolds we see will how the lives of all five of them play out. The focus, though, is on Jules and it’s through him that we see what happens to each of them. It’s a truly multi-layered tale this: it’s predominantly melancholy in tone, as the siblings follow a hard road to their futures, and we really do witness the peaks and troughs a life can deliver. Not only is there the loss of their parents to deal with but also separation as the three of them are split up for the first time in their lives at the boarding school and again later after they’ve gotten together collectively or sometimes in pairings. There is the agonising over unrequited love and the mistakes they make (that we all make) as they grow up, sometimes leading to longer term problems or regrets that will continue to haunt them. There’s also a pervading sense of time running out, things left undone. And there’s a suspicion that lives can be poisoned from the start (the siblings lost their parents and Alva lost a sister) stunting the ability to find happiness thereafter. But there are good times too, successes and moments of pure unadulterated happiness. Apart from enjoying the unfolding of the tale itself, one of the great pleasures of this book for me was the way in which the group wrestle with some of the big philosophical questions in life, such as: do people really have free will and if a different path had been taken would some elements still be the same – would something still survive, the immutable part? For Liz, life is about excitement and stimulation but for Marty and Jules I sense it’s more about finding security and contentment. Different strokes for different folks. Do each of them (or any of them) find what they’re looking for? Well, I’m not going to answer that, you’re going to have to read the book and find out for yourselves! A five star read, without doubt. This book has been a huge success since it’s release, winning the 2016 European Union Prize for Literature, and I can see why. Now translated into English it’s one that you’ll miss at your peril. This was a book about siblings Liz, Marty, and Jules.. who at young ages, lost both their parents in a traffic accident, and then were sent to boarding school for many years. They were separated from each other while there and for the youngest, Jules .. it was especially difficult. This is their story, (mostly focusing on Jules life) and how the sadness of such an early loss affected their entire lives. There are also other great characters in this book to bring about a very meaningful and lovely book! Kevin Ansbro Wonderful review, Karen. I've added this! Karen Kevin wrote: "Wonderful review, Karen. I've added this!" Thank you Kevin, I hope you enjoy it! Benedict Wells started writing his poignant tale of love, loss and loneliness when he was only 24. It took him seven years to write. It is his most personal novel to date. He grew up in a boarding a school from the age of 6.Due to his familial situation of one parent being sick,unable to take care of him, and the other self employed and in financial trouble. Wells cried while he wrote this novel. Jules is 11 when his life is shattered by the loss of his parents in a tragic car accident. The life they once knew and the people they once were is over. He and his older siblings Liz and Marty are sent to a bleak boarding school. Due to their varying ages they are separated and for Jules... the start of loneliness. Jules,now no longer able to rely on the insular unit of his siblings finds himself focusing on Alva his red headed classmate. This intense attraction for Jules is a focus away from loneliness. Alva for Jules is the one and his devotion is unwavering and resolute. Loneliness is the continuous thread that runs throughout this tragic tale. Not just from Jules prospective. In one shape or another loneliness will visit every character at different times in different ways. Considering this novel was translated from German. Charlotte Collins has done a superb job in capturing the level of poignancy the author intended. The writing is evocative, haunting, introspective and above all heartbreaking. Jules’s Dad for me says my favourite quote of the novel! Such a very beautiful and profound quote. It touches me deeply. How reassuring is it in life. If you are blessed to have that very special someone who is always there for you no matter what. Who knows you like no one else. The type of friend who just knows when you need a hug. He/She maybe oceans away or if you’re fortunate around the corner. We all need that one friend who when you are at your lowest will be there to cheer you up and make you smile. Has that way of making you laugh by saying ‘Hakuna Matata’ I’m here for you! You pick yourself up hold your friends hand and face another day! ‘The End of Loneliness ‘ is a beautifully written heartbreaking story. The type of story that each reader will have their own private and personal journey along with Jules and his siblings. Kevin Ansbro I can empathise. Tears welled in my eyes when I wrote a certain part in one of my books. Fab review, Nicola. I've added this! This book is fine. Not fine like in fine china. Or fine like in mighty fine. This is more like the fine I utter when my salmon is a little overcooked. It’s fine, I tell the server, as in, I can still taste a bit of goodness but I definitely won’t rave about this meal later. It’s fine; it will do. So this isn’t a huge endorsement, obviously. And in the same way, I can’t give a huge endorsement to this book. The story is about Jules, whose parents die when he’s young. He and his brother and sister end up at a boarding school. Jules is a sad sack for a while, not finding the right street to walk down, and he’s pining over the girl who got away. There is alienation and blues and happiness and grief. Occasional pieces of wisdom are given, but not thrilling or memorable. First of all, the sister is 14. Seriously—she’d know about French kissing? And a friend saw the tongues sticking down throats? Huh? One doesn’t really SEE tongues during a kiss—they’re enclosed in the mouths, wouldn’t you say? And I’m very sure that a 14-year-old would not make the comment about Labradors. What do kissing and tongues have to do with a pair of Labradors anyway? In fact, while I was reading the chapters set in the boarding school, the kids’ actions and thoughts never seemed to match their age. I’d be surprised if the author had kids. In any case, he should have done his homework. I spent time going back to try to figure out ages, and I was definitely shaking my head no. It was jarring and annoying. This book has lots of fans, so I had high hopes: I thought the book would knock my socks off but instead it made me yawn. This is a fine story and a decent character study, but so? I pretty much felt zippo about the main character, Jules, even though he was vivid and sympathetic. Same goes for his sibs and his love, Alva. This story was more than a meh, but not by much. Described as a Tear Jerker in the magazine review I read but I am afraid this one didn't emotionally affect me in any way and not a tear was shed which may say more about me than the book....... but we do all react differently and as so many of friends found this one a powerful and emotional read, Unfortunately by the end of the novel I was left unmoved and unsatisfied and didn't connect with the characters and to be honest probably wont remember much about this novel a month from now. I do rea Described as a Tear Jerker in the magazine review I read but I am afraid this one didn't emotionally affect me in any way and not a tear was shed which may say more about me than the book....... but we do all react differently and as so many of friends found this one a powerful and emotional read, Unfortunately by the end of the novel I was left unmoved and unsatisfied and didn't connect with the characters and to be honest probably wont remember much about this novel a month from now. I do realise that I am in the minority on this one and respect and enjoyed my Goodread's friends 4 and 5 star reviews but I would be lying if I said I even liked it because I didn't and I think that is ok too. "The story is the account of three siblings: Jules Moreau, the narrator, and his older siblings Liz and Marty. The trio lose their parents in a car accident when Jules is 11, and all move from Munich to boarding school. They grow apart, Marty throws himself into his studies, and Liz falls in with the wrong crowd. Jules retreats into himself until he meets Alva who is dealing with her own family troubles". This is a quiet story with no great twists and turns just a story about loss and loneliness, family and love. Its quite an easy read and a short book but didn't quite pack the punch I was expecting. I didn't connect with the characters and am sure there is a depth to this book that I just didn't get. The one thing I really do enjoy upon finishing a book like this is reading my friends reviews and learning what about the book they enjoyed and connected with and my friends have been very passionate about this novel so perhaps take time to read their 5 and 4 star reviews before deciding whether the book is right for you. Well, this utterly wrecked me. What a beautiful book. The End of Loneliness, translated from the German by Charlotte Collins, follows three siblings growing up in Munich, whose parents die in a car accident, leaving them orphaned and forced to attend boarding school. The focus is on Jules, the youngest sibling, who's more of an observer than a participant in his own life; after his parents' death he turns inward and fixates on a parallel narrative that he's crafted of what his life would have bee Well, this utterly wrecked me. What a beautiful book. The End of Loneliness, translated from the German by Charlotte Collins, follows three siblings growing up in Munich, whose parents die in a car accident, leaving them orphaned and forced to attend boarding school. The focus is on Jules, the youngest sibling, who's more of an observer than a participant in his own life; after his parents' death he turns inward and fixates on a parallel narrative that he's crafted of what his life would have been like had they survived. At boarding school he meets Alva, another loner who he's able to connect with as he and his siblings grow apart, but after school they lose touch and Jules is once more on his own. With a focus on the complex dynamics between the three siblings, Benedict Wells deftly explores the ripple effect of loss and grief. He also plays with the fallibility of memory in a way that recalls Kazuo Ishiguro, as Jules is recounting events from his childhood years later, and eventually certain cracks begin to form in his carefully curated narrative that suggest he may have chosen to remember certain events in a way that was convenient to him. This is a deeply melancholy book that gives little respite in its misery, but I found its emotional honesty refreshing. And with Jules' retrospective narration, the grief discussed feels more like a bruise than an open wound (it's a painful book to read, but not as visceral as something like A Little Life). It did bring me to tears at one point, but it wasn't the kind of painful that I lost sleep over; it's more of a quiet kind of haunting that slowly seeps under your skin. My one criticism is that the end gets a bit twee and Wells insists on wrapping everything up a bit too neatly; maybe he's playing with the idea that one of the characters floats around, that life is a zero-sum game; maybe he thinks his characters have all suffered enough to have earned a neat ending. But as a reader I ironically feel less fulfilled with the more closure I get, so I would have preferred things to end on a slightly more somber note. 4.5 stars - rounded down for now but maybe I'll change it depending on how this stays with me. Also - my advice going into this book is to avoid reading the Goodreads summary if possible (or maybe just read the first paragraph), as it essentially gives a paint by numbers account of the entire plot. It's not that I felt spoiled while reading - it's more driven by character than plot anyway - but it's just unnecessary to give that much away when the book is less than 300 pages to begin with. Wow! This book thoroughly absorbed me. I will remember it for a very long time. It took quite awhile to read as I did keep pausing so many times to reflect on the complex thoughts of the lonely Jules, his struggles with low self esteem and self examination, his attempts to understand the motives of others and especially the love of his life. I made personal notes and re-read sentences, paragraphs and often whole chapters for I felt the complexity of his loneliness so intensely. The book touched Wow! This book thoroughly absorbed me. I will remember it for a very long time. It took quite awhile to read as I did keep pausing so many times to reflect on the complex thoughts of the lonely Jules, his struggles with low self esteem and self examination, his attempts to understand the motives of others and especially the love of his life. I made personal notes and re-read sentences, paragraphs and often whole chapters for I felt the complexity of his loneliness so intensely. The book touched my heart over and over again. The theme of loneliness was there, implicit in all his thoughts and actions but not just in Jules himself. The characters are so beautifully drawn and fascinating too. Loneliness was not the priority of Jules alone. It is there, implicit, in most of his characters,with their restlessness and personal struggles with life especially Alva of course.. They are so human and I felt drawn to them many times as I read their thoughts, words and actions. The love story between the two main characters is intriguing, complex, but really beautiful. I loved the ending too. ||Swaroop|| Wonderful review, Leila! Thank you. Leila Thank you for leaving a comment Swaroop my friend. Ich hätte es niemals erwartet, aber ich habe gerade definitiv eines meiner liebsten Bücher beendet. Ich hab gehadert, geliebt, geweint und sogar geschmunzelt. Während ich seit einer guten Stunde immer und immer wieder mein Geschriebenes lösche, weil ich mir laufend die Frage stellen muss: „Wie rezensiere ich ein Buch, das mich sprachlos zurückgelassen hat?“, entscheide ich mich genau dafür als Anfang. Dabei möchte ich festhalten, dass ganz gleich was ich schreiben werde, Ich hätte es niemals erwartet, aber ich habe gerade definitiv eines meiner liebsten Bücher beendet. Ich hab gehadert, geliebt, geweint und sogar geschmunzelt. Dabei möchte ich festhalten, dass ganz gleich was ich schreiben werde, es wird diesem Roman nicht im Entferntesten gerecht werden. Dieses Zitat war der Anstoß eines großartigen Leseerlebnisses. Es sorgte dafür, dass Benedict Wells neuer Roman meine volle, ungeteilte Aufmerksamkeit bekam. Wie man bisher unschwer erahnen kann, wurden meine Erwartungen nicht enttäuscht. Darüber hinaus möchte ich vorweg nehmen, dass es definitiv die Chance hat, dass beste Buch des Jahres zu werden. Es weckt in mir den Wunsch es jedem zu empfehlen, der bereit ist sein Herz für „Vom Ende der Einsamkeit“ zu öffnen. Doch worauf lässt man sich bei dieser Geschichte ein? Nun, wir lernen Jules und seine beiden Geschwister Marty und Liz kennen, als Jules elf Jahre alt ist und die Geschwister ihre Eltern durch einen Autounfall verlieren. Sie verlieren ihre Eltern, das gewohnte Umfeld, eigentlich sogar ihr eigenes Leben, denn als sie nach dem Tod ihrer Eltern auf ein staatliches Internat müssen, verändert sich alles. Die Geschwister verlieren sich immer mehr und versuchen auf ihre Art mit der neuen Situation fertig zu werden. Jules, der sich immer mehr zurückzieht, findet nur in Alva eine Freundin. Nach den ersten Eindrücken über die Familie und das neue Leben im Internat, begleiten wir die Charaktere über die Jahre hinweg bis sie selbst Erwachsen sind. Jeder von uns wird sich in einem dieser Charaktere wiederfinden. Um ein paar Beispiele zu nennen: Jules ist auf der Suche. Liz ist wie eine rebellierende Reisende ohne Boden unter den Füßen. Und dann haben wir noch Alva, die alles mit sich selbst ausmacht. Wir bekommen im weiteren Verlauf der Geschichte immer wieder einen Einblick in Jules Leben, aber es folgen auch Zeitsprünge. Diese Unterbrechungen in der Erzählung waren für mich während des Lesens sehr wichtig und willkommen, da sie einem die Zeit verschaffen um aufzuatmen und Revue passieren zu lassen. Sowieso habe ich immer wieder nachgedacht, reflektiert, genossen. „Vom Ende der Einsamkeit“ birgt, neben einer grandiosen Handlung, eine ungeheure Melancholie. Wie sonst soll man einen Roman über Verlust, Einsamkeit, Familie und die Liebe schreiben? Es ist wünschenswert, dass man dieser Geschichte sein Herz öffnet. Die Figuren sind so facettenreich gezeichnet, dass sie die Nähe zum Leser brauchen und verdient haben. Sie sind in ihrem ganzen Sein und Handeln einfach menschlich, nicht überzogen oder gar beschönigt. Benedict Wells ist ein wahres Meisterwerk gelungen. Die Figuren sind absolut bemerkenswert, die Geschichte eindringlich und trotz der Schwere abwechslungsreich und der Erzählstil so mühelos und ausgereift, dass jede Zeile puren Lesegenuss darbietet. I had high hopes for this character driven exploration of fate, life, and love but by the halfway point I fizzled out on the story. This is the story of Jules, Marty and Liz, 3 siblings who weather their first tragedy when their parents are killed when they're all still under 16. They're sent to a boarding school and I must say, the author did a fantastic job of portraying the depth of sadness that all 3 experienced because as we learned from the beginning of the story, they were close with thei I had high hopes for this character driven exploration of fate, life, and love but by the halfway point I fizzled out on the story. This is the story of Jules, Marty and Liz, 3 siblings who weather their first tragedy when their parents are killed when they're all still under 16. They're sent to a boarding school and I must say, the author did a fantastic job of portraying the depth of sadness that all 3 experienced because as we learned from the beginning of the story, they were close with their parents and had a happy family life. Jules is the narrator and while I liked him, it did create a situation where I didn't feel like I got to know or understand the story from Liz and Marty's perspectives which I would've liked. Especially Liz as she really struggled after their parents were killed. This book was just OK for me... granted, it's not my typical type of book, but a good story with good characters is still a good story with good characters, regardless of your preferences. I don't feel like this book really had either. It was fine, just not great. I didn't really like or care about Jules. Even his love story with Alva just OK. 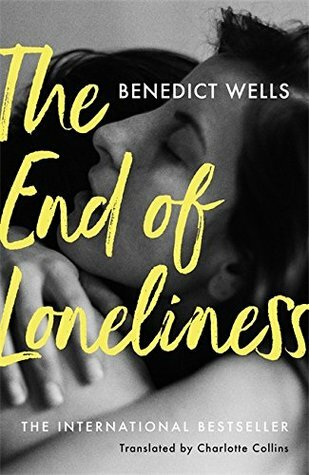 I won the "The End of Loneliness" written by Benedict Wells and translated by Charlotte Collins in the Goodreads Giveaways and was very pleased I did. It was an entertaining story looking at life philosophically, dealing with friendships, illness, death and such like and although very sad at times it was also quite uplifting. General fiction readers should really enjoy this book, it's not my normal genre but I'm glad I won it as I did find it a pleasurable read and probably wouldn't have picked i I won the "The End of Loneliness" written by Benedict Wells and translated by Charlotte Collins in the Goodreads Giveaways and was very pleased I did. It was an entertaining story looking at life philosophically, dealing with friendships, illness, death and such like and although very sad at times it was also quite uplifting. General fiction readers should really enjoy this book, it's not my normal genre but I'm glad I won it as I did find it a pleasurable read and probably wouldn't have picked it up otherwise. Recommended to Paula by: NetGalley. Eleven-year-old Jules and his siblings, Marty and Liz, live sheltered, seemingly idyllic lives in Munich with their devoted mother and father. Until, that is, both parents are killed in a catastrophic road accident while motoring in France and the children are sent to a grim state boarding school, where they rapidly drift apart. Jules changes from a fearless, vivacious boy into a withdrawn teenager who writes stories and lives through his imagination. The only person able to reach him is the equally damaged Alva, whom he comes to love, but they are divided by a misunderstanding after leaving school. Many years later they are given a chance to make amends, but their relationship has never been straightforward – grief shadows both their lives. Seven years in the writing, The End of Loneliness is German author, Benedict Wells' first novel to be published in the UK. Prior to translation it won the European Union Prize for Literature, was on the German bestseller list for over 18 months, and was translated into 26 languages. Born in Munich in 1984, Wells writes from experience. He attended three separate Bavarian boarding schools from the age of six, and like his protagonists, suffered acute loneliness. He moved to Berlin after graduating in 2003, but decided against attending university, opting instead to focus on writing while earning his living by holding down a variety of jobs. He lived in Barcelona for a period but has recently returned to Berlin. Superbly translated by Charlotte Collins (award-winning translator of The Tobacconist), The End of Loneliness is a book you fall into from the first page. It is a poignant exploration of the past told through the ruptured lives of the siblings: a moving tale of loss, longing and familial love. Wells has produced an outstanding piece of writing; one that will linger in your thoughts long after the story ends. Was für ein feinfühlig geschriebenes Buch. Da mir die Tränen bei einer Szene runterliefen, bleibt wohl nicht mehr viel anzufügen. 5 Sterne. 5 Sterne, aus tiefstem Herzen. Könnte man sich mit einem Buch verheiraten, ich würde dieses hier sofort vor den Traualtar zerren. Ich habe Benedicts Bücher alle gelesen und mochte sie auch alle (vor allem den Vorgänger, "Fast genial", für den er gerade am Film-Drehbuch schreibt), aber hiermit ist ihm sein bisheriges Meisterwerk gelungen. Die relativ lange Zeit, die er sich für das Schreiben dieses Romans genommen hat, hat sich definitiv ausgezahlt. Das Buch ist ein wenig anders - reifer, ist vie 5 Sterne, aus tiefstem Herzen. Könnte man sich mit einem Buch verheiraten, ich würde dieses hier sofort vor den Traualtar zerren. ein tolles Buch, aber sehr viel Tragik - vielleicht sogar etwas zu viel... aber dennoch habe ich es sehr gern gelesen. Nun fühle ich mich etwas befreit von all der Schwere. When the parents of young Jules, Liz and Marty Moreau die in a car crash, the children are sent to a boarding school. Jules is separated from his brother and sister and has a difficult time adjusting. He once was the only one brave enough to cross a dangerous tree that had fallen across a waterway but now he feels vulnerable and retreats to his memories and books. When he meets Alva, he recognizes a kindred spirit. Alva also has had tragedy in her life. But their friendship falls apart, although When the parents of young Jules, Liz and Marty Moreau die in a car crash, the children are sent to a boarding school. Jules is separated from his brother and sister and has a difficult time adjusting. He once was the only one brave enough to cross a dangerous tree that had fallen across a waterway but now he feels vulnerable and retreats to his memories and books. When he meets Alva, he recognizes a kindred spirit. Alva also has had tragedy in her life. But their friendship falls apart, although 15 years later, Jules still holds hope that they might meet again. She is the only one he can envision going through life with. This is a tender, beautiful love story. There is a special charm to it that is very touching. It’s not so much what happens in this story as the way the author tells it, which of course is the mark of a talented author. This is a multi-layered novel, asking the questions “What if I had taken a different direction, what would my life be like now?”, “Can happiness be stunted by events when we’re young so we can never know happiness?” and “If you spend all your life running in the wrong direction, could it be the right one after all?” Mr. Wells’ style is quite reminiscent of John Irving’s. I will long remember the story of Jules and Alva. This is the first of German Benedict Wells’ books that has been translated to English. I hope it won’t be the last. Most highly recommended. Upravo sam završila ovu knjigu i ostala sam zatečena. Knjiga je to koja me je do srži uzdrmala i mislim da ću je još dugo pamtiti. Glavni protagonist romana je Jules Moreau, čovjek koga život nije mazio. On, njegov brat i sestra nakon što im roditelji poginu, primorani su živjeti u internatu. Jules je dječak koji se nikako ne može naviknuti na teškoće života bez roditelja, no s vremenom uviđa da se mora prilagoditi ovakvoj novonastaloj situaciji i životu koji se odvija po nekim određenim pravilima. P Upravo sam završila ovu knjigu i ostala sam zatečena. Počinje se koliko -toliko prilagođavati novonastalom životu, ali stalno vračajući mislima na onaj kobni dan kada je izgubio svoje roditelje. U internatu upoznaje djevojčicu Alvu i gradi jedan divan, nježan i prijateljski odnos pri čemu mu dolaze na pamet riječi oca da je pravo prijateljstvo vrlo važno: "Najvažnije je, Jules, da stekneš pravoga prijatelja. Pravi je prijatelj netko tko je uvijek tu, tko je cijeli život uz tebe. Moraš ga steći, to je važnije od svega, pa i od ljubavi. Jer ljubav može proći..."
Glavni narator knjige je ujedno Jules i s s vremenom on postaje odrastao čovjek. Ja vam neću pričati daljnji tok knjige, ali vam mogu reći da sam čitajući je postala saveznik glavnog lika. Njegov život i osjećaji, gubitci i uspjesi...sve me je to navelo da navijam za njega. Istovremeno u knjizi pratimo i ljubavnu priču, koja po svim pravilima odudara od svakodnevnih priča. događaju onako kako se događaju. Ponekad pravedno, da sve ima nekog smisla,ponekad toliko nepravedno da čovjek u sve posumnja. " " Radije osam godina s tobom nego pedeset bez tebe." "Kraj samoće" je jedna divna saga o odrastanju i teškoćama života mladih ljudi koja će vam na kraju izmamiti i koju suzu. Eine schwierige Kindheit ist wie ein unsichtbarer Feind, dachte ich. Man weiß nie, wann er zuschlagen wird. 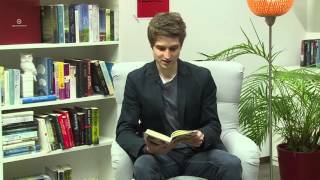 Benedict Wells hat mit diesem Buch ein absolutes Meisterwerk geschaffen. Noch nie habe ich einen Roman gelesen, der eine solche Wucht von Schwermut, Traurigkeit und Schicksal vermittelt hat. Selten habe ich ein Buch gelesen, dass so eine Emotionstiefe hatte, die sich mit dem Aufschlagen des Buches immer wieder in mir ausbreitete. Ich denke an das Buch, sehe es manchmal nur an, und fühle mi Eine schwierige Kindheit ist wie ein unsichtbarer Feind, dachte ich. Man weiß nie, wann er zuschlagen wird. Benedict Wells hat mit diesem Buch ein absolutes Meisterwerk geschaffen. Noch nie habe ich einen Roman gelesen, der eine solche Wucht von Schwermut, Traurigkeit und Schicksal vermittelt hat. Selten habe ich ein Buch gelesen, dass so eine Emotionstiefe hatte, die sich mit dem Aufschlagen des Buches immer wieder in mir ausbreitete. Ich denke an das Buch, sehe es manchmal nur an, und fühle mich deprimiert oder zumindest so, als müsste ich dringend einen tiefen Seufzer loswerden. Ich fühle mich irgendwie bedrückt. Und das meine ich keineswegs negativ, denn dieses Buch hat mir etwas vermittelt und es hat mich auf jeder einzelnen Seite dazu gebracht, mich völlig anders zu fühlen, nämlich genauso, wie sich womöglich die Figuren dieser Bücher gefühlt haben. Die Atmosphäre ist sehr dicht, sehr ausgeprägt und immer präsent. Es gibt in diesem Buch keine Seite, keine Aussage, die irgendwie fehl am Platz wäre oder die überflüssig war. Man merkt dem Buch an - vielleicht nicht unbedingt die sieben Jahre Arbeit, aber - dass der Autor sich viel Zeit genommen hat für seine Figuren, für seine Handlung und für die Gefühle innerhalb des Romans. Es ist unfassbar zu sehen, wie Worte und Gefühl hier zusammenspielen, wie sie ineinanderfließen, weil Benedict Wells es versteht, Worte mit Sinn zu füllen und die Zwischenzeilen mit Leben. Auch die Charaktere in diesem Buch haben allesamt ihre Eigenarten und sind ganz große - ganz verschiedene - Persönlichkeiten. Sie sind Großartigkeiten, ehrlich, denn sie treten aus dem Buch heraus und ziehen uns die Sympathie und die Empathie für sie aus den Herzen. Zusätzlich hat das Buch ganz viel zu sagen über das Leben, es wirkt sehr weise, weswegen ich darum bitte niemals einen noch jungen Autor vorzuverurteilen oder gar zu unterschätzen. Benedict Wells hat viel über das, was er schrieb, nachgedacht und hat das Beste für uns in diesen Seiten zusammengestellt. Mir hat dieses Buch explizit wieder gezeigt, wie wichtig es ist, zu leben, zu lieben, zu vertrauen, auf die Fresse zu fallen, wieder aufzustehen, nicht aufzugeben, aber vor allem man selbst zu sein. Zu tun, was man will, was man für richtig hält, was einem das Herz sagt. Niemals stehenzubleiben, der Angst zu trotzen, an sich und anderen zu wachsen. Für mich ein Meisterwerk, ein außergewöhnliches Buch, das mich lange und intensiv begleitet hat und noch sehr lange nachhallen wird. Da bin ich mir sicher. Es sencillamente la historia de Jules, contada a través del paso de los años y marcada por la muerte de sus padres. Me ha recordado a Canciones de amor a quemarropa en la forma en la que está contado (que no en la trama en si). Se lo recomendaría a cualquiera. German author Benedict Wells has written a complex, thought-provoking book about all the important things in life; family, friendship, finding your place in the world, determining what sort of person you will become. We meet the narrator, Jules Moreau, in the hospital after he was involved in a motorcycle accident. He starts reflecting on all the events that brought him to this place. Jules is the youngest of three siblings. Liz is the eldest in the family, Marty is the middle child, and Jules is the daredevil youngest child. He talks about their family life before the big event in their childhood, and then describes their lives being separated at a rather grim boarding school after the death of their parents. This is a magnificently compelling, if a little bit grim, tale about how the siblings each deal with the death of their parents, in their adolescence and adulthood. The writing was brilliant. I’ve never stopped to make as many notes on my Kindle as I did with this book. I have so many great quotes that I’d love to share, but I feel constrained by the review length to just share three of my favorites to give you a flavor of the things that made me stop and ponder while reading this book. This writing is at times stop-you-in-your-reading-tracks incandescent. We follow all three siblings as they find their way in the world and work through the loss of their parents. Some seem to roll with the punches, some retreat into addiction. Ultimately this is a story about creating a family in whatever form you find it, and finding in them and with them the strength to keep moving forward. Originally I was going to give this 4 stars because the story to me was dark. But as the days have gone by, the story keeps popping up in my head. The characters still live there. Scenes and quotes float into my consciousness at seemingly random times. This book is about death, life, and family. It’s about the choices we are faced at cataclysmic events. The author and translator did a fabulous job with presenting one family’s path through the minefield that we all have to face as the price of being alive and being human. ‘Thank-You’ to NetGalley; the publisher, Penguin Books; and the author, Benedict Wells; for providing a free e-ARC copy of this book in exchange for an honest review. Benedict Wells wurde 1984 in München geboren. Im Alter von sechs Jahren begann seine Reise durch drei bayerische Internate. Nach dem Abitur 2003 zog er nach Berlin. Dort entschied er sich gegen ein Studium und widmete sich dem Schreiben. Seinen Lebensunterhalt bestritt er mit diversen Nebenjobs. Sein Debüt ›Becks letzter Sommer‹ erschien 2008, es wurde mit dem Bayerischen Kunstförderpreis ausgezeichnet und fürs Kino verfilmt. Es folgten sein ursprünglich erster Roman ›Spinner‹, den er mit neunzehn geschrieben hatte, und ›Fast genial‹. Im Jahr 2016 erschien sein vierter Roman ›Vom Ende der Einsamkeit‹, der über achtzig Wochen auf der Bestsellerliste stand und zum Lieblingsbuch der unabhängigen Buchhandlungen gewählt wurde. Er wurde u.a. mit dem European Union Prize for Literature prämiert und in bisher 26 Sprachen übersetzt. Benedict Wells spielt Fußball in der Autoren-Nationalmannschaft und ist Halbschweizer; neben der deutschen besitzt er als Sohn einer Luzernerin auch die schweizer Staatsbürgerschaft. Nach Jahren in Barcelona lebt er wieder in Berlin.